Last year, on a retreat in the Peruvian Amazon, I made a heartfelt connection with a therapist who invited me to work in her homeland of Kyrgyzstan, a part of the world I’d yet to visit. I’d never met this woman before and even though I couldn’t speak her language, I intuitively trusted her and immediately accepted the offer. Fast forward 6 months and my girlfriend and I find ourselves at Bishkek airport in the early hours of the morning with no translator and very little information about where we’re going or what to expect about to embark on a 6 hour trip into the countryside of Kyrgyzstan. Kyrgyzstan is a country that until 1991 had been part of the Soviet Union for 70 years. It was a place that I had considered off limits for most of my childhood and teenage years, yet here I was about to embark on a journey deep into the heart of its country to introduce its people to Kambo. 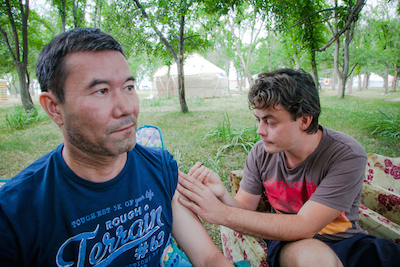 As it turns out, the people of Kyrgyzstan won me over as much as Kambo won them over. And what started out as a ten day trip into the unknown, turned into a steep learning curve and a 6 week tour of the country and neighbouring Kazakhstan. Geographically, Kyrgyzstan resembles Mongolia and other countries in the surrounding area. It has a natural, rugged beauty with imposing snow-capped mountains and spectacular scenery. Traditionally the population is Nomadic, but after the Soviet conquest people were forced into more settled ways of life. Initially this change took a terrible toll and many people died of starvation due to their inability to adapt to modern agriculture. Many people were sent to Kyrgyzstan from all over the Soviet Union to develop agricultural programs and many more were sent as political prisoners (Germans, Polls, Ukrainians, Greeks, Jews and other so called ‘undesirables’). At the end of the cold war many decided to stay and integrate into society; consequently the people of this country are ethnically among the most diverse I have ever experienced. It was mainly women that joined my Kambo circles and it was clear from the outset that the men in this region have yet to become interested in personal growth. 70% of people I worked with during my time in Kyrgyzstan came from the neighbouring oil-rich country of Kazakhstan. The women in this part of the world have experienced oppression from ancient times and on one day trip to the mountains we witnessed a man on a horse whipping his wife and daughter in the middle of the village street. I asked our guide what was happening and he explained that every Friday it was traditional for a man to beat his wife and family to earn respect. Clearly I was outraged at such an antiquated tradition, however it helped explain the many emotional scenarios I was yet to experience in my Kambo circles. Health wise, cancer is rife, specifically of the breast. This is hardly surprising when you consider the many years of suppression that women have been subjected to. In a recent study conducted by Kings College Hospital of London, extreme suppression of anger was the most commonly identified characteristic of 160 breast cancer patients. Other prevalent conditions that I had never before heard of, such as ostechondrosis were also commonplace. Meanwhile the health system in this part of the world is not great and as is typical with many health systems worldwide, their default course of action for a cancer diagnosis for example, is to simply cut out the infected bits. Right from our first circle, we immediately noticed that these people have a very low tolerance to Kambo. In 90% of treatments, three dots proved more than enough medicine. But more than that, the frog began to reveal the emotional wounds that people were carrying. We often experienced a lot of crying, sobbing, howling and the sounds of rage in the ceremonies. None of this felt hysterical but it was a real expression of what these people had been carrying for so many years. The gift of Kambo helped them to express what was inside. We knew how healing Kambo was for these people, but we were still surprised when so many came back for 2nd, 3rd and even 4th treatments, often bringing relatives and friends from far away. We were asked to get more medicine and return a week later. Even though we were exhausted after a full on schedule of kambo and bioenergetics we were so touched by the people and their passion for the work we could do nothing but agree. And so a week later we found ourselves back on a plane, this time flying first to Kazakhstan and then travelling back to Kyrgyzstan. – If your translator is slow or you are in any doubt about their abilities, don’t be shy to ask for a replacement. – Ensure you have enough translators. Larger circles (I would say anything over six people) will require a minimum of two translators, one for yourself and one for your helpers. – Assess your translators’ suitability to the job beforehand. We had a situation where one of our helpers/translators struggled to cope with the energy in the circle. Consequently she spent little time actually helping and was physically sick when the circle closed. If possible, document important information ahead of time in the native language. Information such as who can’t take Kambo, what to expect and what to bring to a circle is useful. Ask your organisers to circulate this to all attendees prior to their treatment. Due to mis-communication in our early circles we had to reject several people due to the fact that they’d eaten breakfast that morning or consumed large quantities of alcohol the evening before. Prepare yourselves to spend longer than you would normally take. Due to the fact that everything requires careful translation, we found our circles taking longer than in an english-speaking country. Due to the time it takes to translate everything it can be tempting to overlook a patients’ medical history, don’t! We had a case where a woman was on anti-epileptic medication. The organizer advised her to stop taking it the week earlier and we were not told of its presence. Her first Kambo treatment went well, however after administering Sananga following her second treatment the woman had an epileptic seizure. It was a pretty dramatic situation with the woman biting her tongue and blood everywhere. She was fine in the end however the experience left me feeling shaky and guilty until I discovered that she had stopped taking her medication because she believed the Kambo had cured her epiliepsy after the first treatment. The takeaway for me from this was to always take my time (even when translation is required) to understand where everyone is in terms of medication and supplements. It was only when we arrived in Kyrgyzstan that we discovered our ceremonies would be held outdoors. It was a scenic place and apart from the regular visit of a heard of cows around noon, this worked well most of the time, however we did need to scramble a back-up venue when the rain came. The outdoor toilets were also amongst the worst I have ever seen – a squat toilet with buckets of sand used to cover excrement and flies everywhere. While these people were used to such facilities, on Kambo things are different and in the end we needed to get a specially fitted chair with a hole in it. Don’t be shy to ask about the facilities at the outset and communicate what you need. The more prepared you can be the smoother your kambo circles will run. Ok, so this is probably intuitive, but be prepared for demand to outstrip supply. My advice, it’s better to take too much medicine than to turn people away. In my case, people turned out to be extremely emotional on Kambo. It doesn’t make them wrong, it just means that working with people in other countries is different. Because of their history, this is what Kambo brought out in them and it turned out to be exactly what they needed. Let the energy flow and allow situations to unfold without trying to control them. Trust the frog! I had a woman that was meant to come for Kambo. My mind said it was ok, but the frog said NOOOO!!! I trusted the frog and instead gave the woman a Bioenergetic session. As soon as I started the session I understood why the frog said no. This woman was 32 and still getting called five times a day by her overbearing parents demanding to know what she was doing. She had witnessed huge amounts of domestic abuse throughout her childhood and basically would not have been strong enough to continue in a functional way after Kambo. She needed some coaching and basic therapy prior to her treatment, but by the time I returned to Asia the second time she was ready to do Kambo; I’m pleased to say she’s now fully in the flow. Certain diseases are not universal so it’s helpful to know beforehand what kind of medical issues you’ll be facing prior to arriving. Osteochondrosis is not common in Europe for example, yet I had several people in my circles report on this condition. Also finding out a little about the culture beforehand can prepare you for any emotional issues that may surface.